Yesterday we drove down to southern Indiana to visit Magnificent Mushrooms, Eric Osborne’s hub for all things mycological. 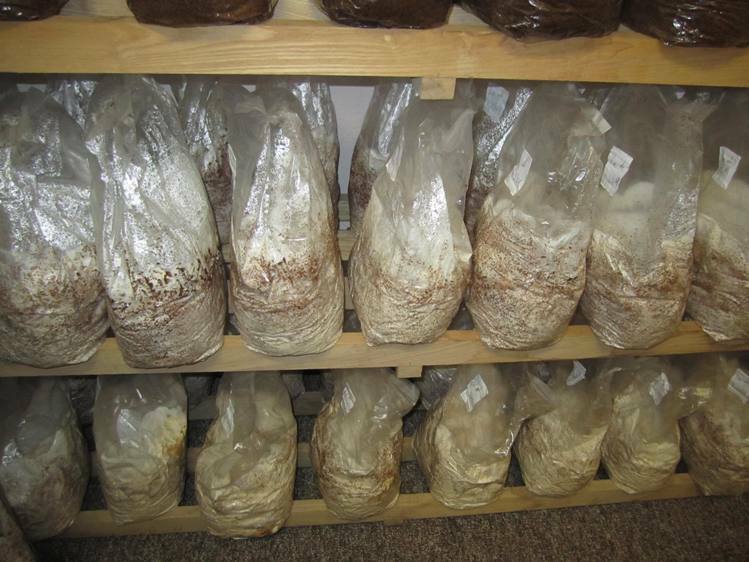 Located outside of Paoli, IN, this growing business offers products and information for the would-be home mushroom cultivator. That turns out to be us: we came home with three kinds of spawn to put to work here on our wee homestead: “old faithful” shiitakes, Lion’s Mane, and King Stropharia (winecaps). 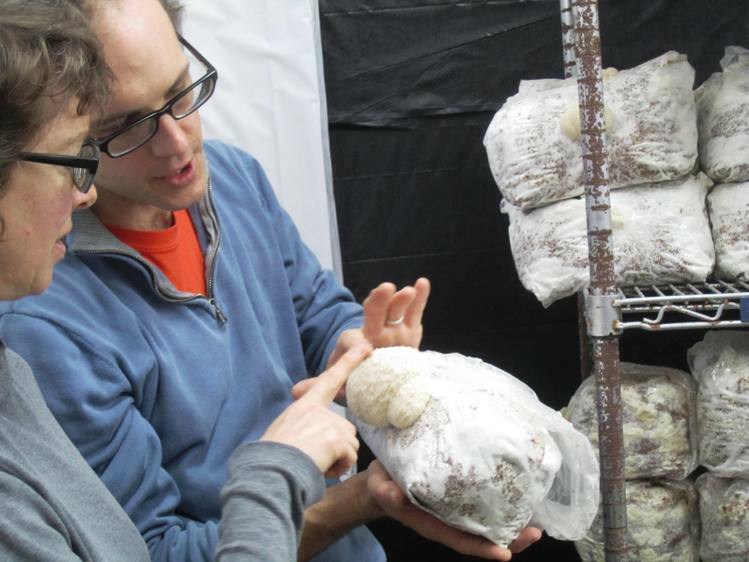 I will keep you posted on our efforts to expand our food production into the fungal kingdom! I’m a bit concerned about keeping Kitley (our outdoor cat) and his pals away from the logs and woodchips we’ll use as substrate. As I understand it, mushrooms are tolerant of many things…but they probably wouldn’t want to drink cat pee or get all clawed up, any more than I would. Old Faithful is a strain of shiitake that fruits in a slightly furry mushroom. Here it is growing off a block of sterilized, inoculated grain. I’m most excited about attempting to grow winecaps, also known as “the garden mushroom” for its friendly affinity for the vegetable garden. We plan to try starting it not only in our backyard beds, but also in a low-lying place in the front yard. A natural bowl beneath the sweetgum tree is often waterlogged, and Eric said this kind of spot is perfect for winecaps. As for Lion’s Mane, I’ve never eaten it, but Eric says it tastes like “heaven on earth.” It’s a pale blobby mushroom that looks a bit like some oceanic organism. Or maybe a cartoon nose. Eric and I petting a Lion’s Mane mushroom. Eric sells his harvest to area chefs, so if you’ve eaten a mushroom dish at a Bloomington restaurant, you may have sampled his wares. He also offers cultivation workshops and consultations. 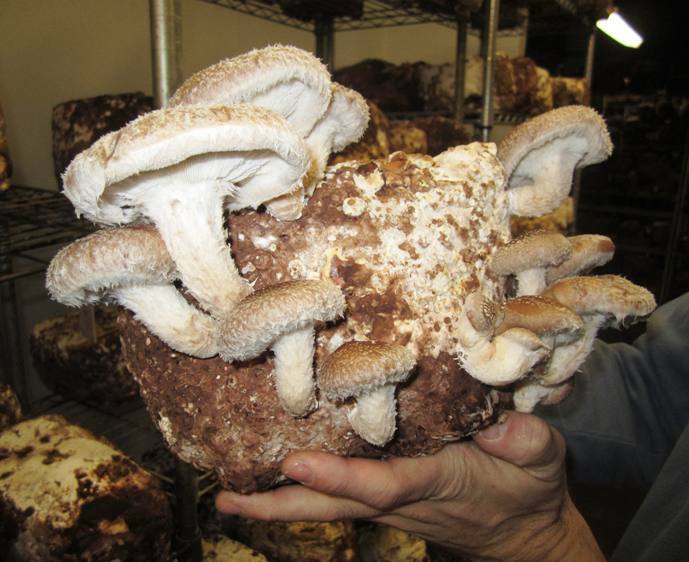 In partnership with the Hoosier Mushroom Society and the state department of health, he’s developed a certification course for wild mushroom hunters, which would allow them to comply with regulations around selling their harvest. Speaking of: Know any good morel hunting spots? This entry was posted in Conscious Eating, Homesteading and tagged Cooking, Do it yourself, Food Security, Foraging, Garden, Indiana, Local food, Magnificent Mushrooms, Medicinal Mushrooms, Mushroom, Mushroom Hunting, Mycology, Paoli, resilience, shiitakes, Small but Mighty, Sustainability. Bookmark the permalink.